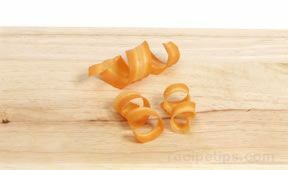 Garnish your salads or main entrée with a carrot curl. 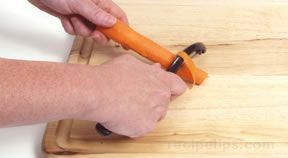 Before slicing, use a vegetable peeler to cut a strip of the peeled carrot. 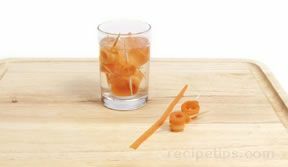 The carrot strip must be rolled and secured with a toothpick. Place in a cold glass of water in the refrigerator. Wait 2 to 3 hours and remove from water. When toothpick is removed, the peel should remain curled, stretch the curl out and place on the plate as a colorful garnish.